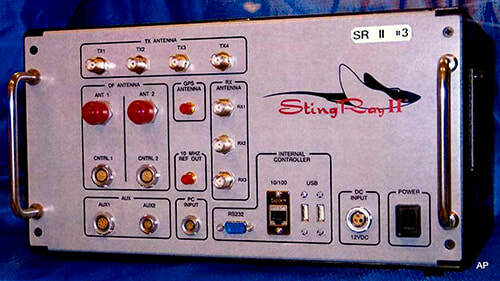 Phone Tracking - Drone Inc.
Nearly all mobile communication devices are designed to be tracked. A cell phone carrier, for instance, must generally know where all phones and towers in its network are at any given time. Otherwise a call placed in Karachi couldn’t be directed through the network to its receiving phone in Paris. The military understands and exploits this. It knows that mobile phones send signals every few seconds looking for nearby towers so they can be reached. Every time a cell phone pings a tower, the tower creates a record of that connection and tells the rest of the network. Thus intelligence agencies monitoring the network infrastructure, or receiving information from the service provider, can use this information to track phones as they transit tower coverage zones, known as “cells,” around the world. Even with access to that information, though, it is still a surprisingly difficult task to find the exact location of a cell phone. Cells can extend for miles and, contrary to popular belief, connecting to a given tower is not always an indication that a phone is within that cell. Although it seems logical that a mobile phone would automatically connect to the closest tower, that’s not always the case. Instead it sends a radio message to all the local towers it can find. At a regional switching center, special software routes a call by checking a host of factors: the phone’s signal strength, the local weather, and what towers are shut for maintenance. Each mobile phone tower maintains a visitor location register, but there’s no guarantee that the phone was actually close to it. “The system is so fluid that you could sit at your desk, make five successive cell calls and connect to five different towers,” adds Starr. “The switching center may look for all sorts of factors, most of which are proprietary to the company’s software. The only thing that you can say with confidence is that I have connected to a cell site somewhere within a radius of roughly twenty miles.” That’s a little like knowing which county a house is located in but not knowing which town, let alone the street address. 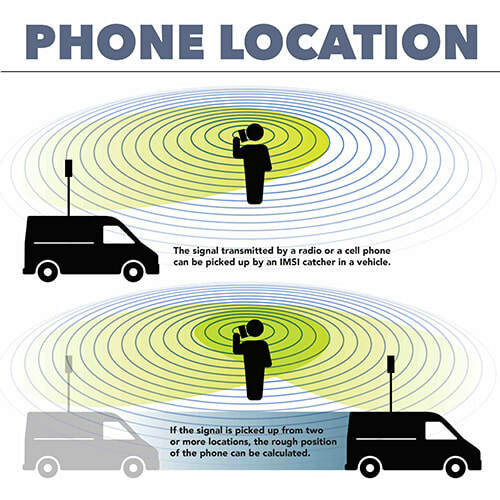 In order to track mobile phones, the military uses radio locating devices known as IMSI catchers together with specialized software to conduct “geolocation,” i.e., the capability to locate a phone on a map. We’ll discuss IMSI catchers first and then address geolocation software in a later section. While the fake tower can easily get a list of all the mobile phones in range, it can only approximate, based on signal strength, how far away each connected phone is. If the IMSI catcher also has a “direction finding” antenna, it may be able to guess the rough direction that a signal came from. Mountains, buildings, and other objects can further degrade reception. Smart phones typically contain two radios. In addition to the receiver/transmitter that works on GSM or CDMA networks and allows users to exchange calls, text messages, and other data via local mobile phone towers, a smart phone also has a one-way GPS receiver that helps the phone locate itself. ​Since a GPS device is only a receiver, i.e. for a user – be it a phone owner, a vehicle or a drone – to find their own location, it is not able to transmit its location to anyone else. However, when a smartphone user enables location sharing, this GPS data can be shared with apps via the second radio in the phone and used to calculate directions or nearby places of interest from cached databases. And while GPS location data could theoretically be hacked, this does not affect most users in Afghanistan and Yemen who have not historically used smartphones or GPS devices.